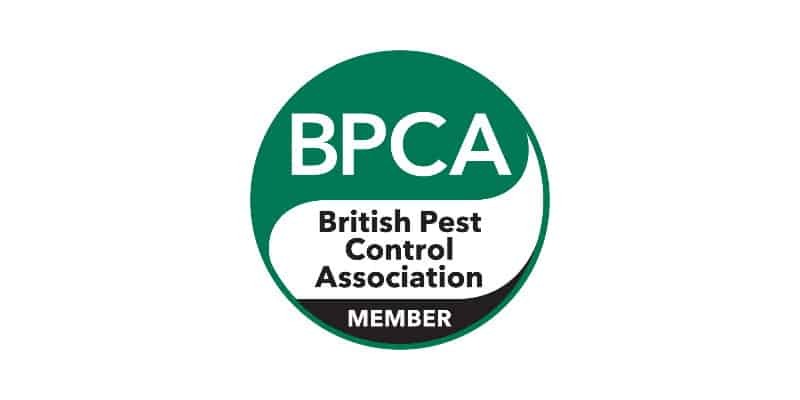 The British Pest Control Association (BPCA) is the official UK trade association representing all companies and individuals professionally involved with the eradication of public health and nuisance pests. The BPCA places great importance on promoting the highest standards of professionalism within the industry. It plays a major role in enhancing these standards by way of training courses & examinations, publications, exhibitions and conferences. Pest Solutions are full active members the British Pest Control Association. Our BPCA Membership certification is renewed annually and this years certificate (M15/748) is viewable opposite. 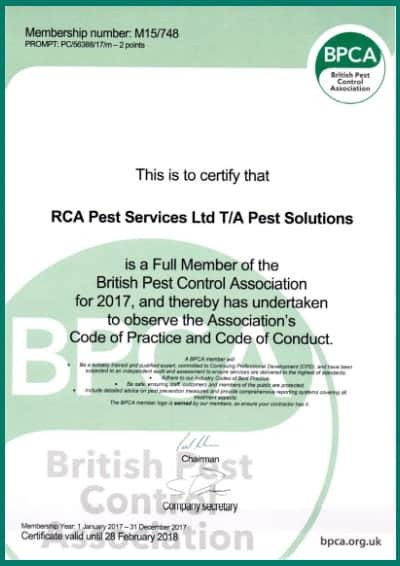 At Pest Solutions we are also audited on a regular basis by the British Pest Control Association (BPCA) to ensure that we continue to meet the high standards laid down by the Association. Our most recent audit the BPCA auditor confirmed that we offer a service of the highest standard and specifically praised our reporting systems. Pest Solutions have regional Branches throughout Scotland, England, Wales and Northern Ireland . Our experienced local techs are at hand to visit today. BPCA Member Company. Give us a call now to have a skilled member of our fully trained service team come and aid you in dealing with that Pest Management problem. To further trade interests of members by promoting the development of pest control service operations and allied product sales covering food storage practice, public health, domestic situations, and ancillary operations. To encourage the setting and maintenance of high technical standards for the products, methods and appliances used in the control of pests, as well as of their storage, transport and disposal. BPCA Code of Conduct. To institute and sustain programmes of education and training in pest control, with the objective of improving competence and implementing effective systems of assessment. To encourage research on industrial, commercial and domestic pest control problems and to collaborate with other bodies interested in these matters. To observe and keep members informed of the operation of existing laws and practices relating to pest control operations, and of all codes of practice and legislative proposals which may affect or tend to affect the interests of members. To provide a medium for putting the views of the industry before Government and other authorities, and for making representations regarding legislation, projected legislation and recommendations which may affect the interest of members. To co-operate with other organisations in the world having similar or allied aims. To conform with all regulations, other relevant legislation and to do all other lawful things incidental or conducive to the attainment of the objects of the Association. Act positively to safeguard people and the environment by ensuring that actions taken to control pests do not have a detrimental environmental effect. Ensure that all research and development work meets current statutory requirements at all times. Comply with, and ensure that working procedures and records demonstrate complicity with, the provisions of all appropriate legislation in force from time to time together with recommendations made in all relevant Codes of Practice and Guidance Notes. See Appendix 1. Where necessary members will co-operate with the BPCA’s appointed consultants or employees when carrying out routine company assessments. Ensure that any form of promotion, including verbal presentation complies with legal requirements and with accepted codes of practice including the British Code of Advertising Practice. Ensure that technicians who undertake pest control operations shall have been given adequate training to ensure that they are competent to carry out their duties. This shall be evidenced by assessment under the BPCA Certification Scheme, or other approved scheme at the earliest possible opportunity. Those who are not so qualified should, at all times, have recourse to the guidance of a qualified supervisor or advisor. Maintain business integrity in fulfilling contracts and honouring guarantees given. Publicise their professional services in a responsible manner ensuring not to create an invidious distinction between other members, nor make public criticism of fellow members, always bearing in mind that the dignity of the Association is never jeopardised in any manner and that the profession is not brought into disrepute. BPCA Code of Conduct. Honour agreements made by the Association at all times. Carry adequate public and product liability insurance and, where necessary, employer’s liability insurance. Manufacture, formulate and package in such a manner as to minimize environmental contamination. Ensure that all products manufactured by them or on their behalf are in accordance with suitably defined specifications backed by adequate quality control facilities. Ensure that all technicians in charge of fumigations using methyl bromide are certificated for those types of fumigations for which they are responsible by holding an Association Certificate of Proficiency for the appropriate modules. Ensure that all certificated and trainee technicians are registered with the BPCA and that this registration is updated annually and upon the commencement or termination of employment. BPCA Code of Conduct. Store, transport, handle and use fumigant gases in strict accordance with the guidelines issued from time to time by HSE, the Association and Government legislation. At all times act in accordance with the provisions and intentions of this BPCA Code of Conduct as it applies to them. The enforcement of the BPCA Code of Conduct will be the responsibility of the Executive Board, and any member not conforming to its requirements will be liable to expulsion. Pest Solutions have regional Branches throughout Scotland, England, Wales and Northern Ireland . Our experienced local techs are at hand to visit today. BPCA Code of Conduct. Give us a call now to have a skilled member of our fully trained service team come and aid you in dealing with that Pest Management problem. The BPCA Codes of Practice are designed to ensure that all professional pest control companies and trained individuals carry out potentially dangerous and / or sensitive activities with continued regard for safety and humaneness. Pest Solutions and all of our service personnel are required to operate within the bounds of these BPCA Codes of Practice. These BPCA Codes of Practice were produced by the British Pest Control Association. In certain circumstances feral cats can pose a threat to public health. When all other options have been considered, pest control servicing companies may be requested to cage trap these animals, remove them from site and dispose of them. BPCA Codes of Practice. In the past the accepted method for disposal of these animals was to introduce the cage trap into a lethal chamber containing a measured dose of chloroform. This method has been called into question both in terms of humaneness and operator safety. The Association has therefore produced this guidance note to its members and recommends that they follow the BPCA Codes of Practice laid down below. Domestic Animals – All cats cage trapped be examined for signs that they may be household pets (collars, tags etc.) and if so that they be released. Rehabilitation – The servicing company should liaise with the Cats Protection League or other similar agencies with a view to rehabilitating some, or all, of the trapped animals. BPCA Codes of Practice. Destruction – In the event that rehabilitation is not possible and there being no alternative to destruction, the procedure adopted should be that of a lethal injection administered by a veterinary surgeon. These BPCA Codes of Practice were produced after consultation with Defra and Natural England. In order to protect public health within high-risk environments, the use of rodent glue boards remains an important last option when all other control methods have been considered ineffective. Although glue boards are not designed to physically harm rodents, their use raises valid concerns and they should only be sold to or used by technicians who have been given adequate training and are competent in the effective and humane use of this technique. Option of Last Resort – All other options for rodent control must be considered before glue boards are used. Detailed records must show why other control methods are either considered inappropriate or have failed. Where there is a rodent in a high risk environment, it may be appropriate for glue boards to be placed strategically to ensure immediate control. Check Boards Frequently – Where rodent boards are used these must be inspected at appropriate intervals. This should be within 12 hours of placing, or at least as soon as is reasonably practicable, including weekends and bank holidays. If unavoidable events cause slight extensions to inspection intervals then the reasons should be recorded. BPCA Codes of Practice. Longer delays must be avoided (see contingency plan below). Where possible and practical, inspection times must be organised to minimise the time rodents are likely to be on the board (e.g. if rodents are known to be active during certain periods, inspection times should be arranged with this in mind). If a caught animal displays signs of undue suffering or serious physical harm, the intervals between inspection times must be shortened. Records must be updated after all inspections. BPCA Codes of Practice. Contingency Plan – A contingency plan must be in place so that in the event of an emergency a second competent person can be called upon to inspect the boards and deal with any captures or safely remove the boards as appropriate. BPCA Codes of Practice. Where it is known boards will not be inspected at appropriate intervals they must be taken up (even if only temporarily). Protect Non Target Species – Boards must be placed in such a manner that they do not present a risk to non-target species. Use the Correct Size Board for the Pest Species – The size of board must be appropriate for the target species. Detailed Records – Detailed copies of records and location plans should be available on site at all times for all boards laid during any treatment and must be updated as necessary to ensure traceability. Copies ensure information is available should site records be lost or unavailable. Dispatch of Trapped Rodents Humanely – Rodents trapped on rodent boards must be dispatched quickly and humanely by technicians with appropriate training. BPCA Codes of Practice. Placing the glue board in a clear plastic bag and dealing the rodent a sharp blow to the head with a blunt instrument would be an appropriate mode of dispatch. Drowning is not an acceptable method of dispatch. Non Target Animals – In the event that a non-target animal is trapped, a suitable food grade oil or similar emollient should be applied to the animal for removal, or if not a protected species it may be killed humanely. Non-targets should only be released at their site of capture, not elsewhere, and only if they appear to be physically unharmed and their release is not prohibited by law. Remove Boards at the End of Treatment – At the end of treatment all rodent boards must be accounted for, removed by the technician and the records endorsed accordingly. Dispose of Boards Safely – Rodent boards should be disposed of with care. The sticky surface should be covered to avoid the accidental trapping of non-target species or subsequent misuse, and the board should be disposed of in accordance with local authority waste requirements. BPCA Codes of Practice. Communication With the Customer – Code of Best Practice must be provided to the customer to make them aware of the standards that the operative is working to. The humane use of glue boards is the legal responsibility of the pest controller, and cannot be delegated to untrained people. All technicians must be suitably trained and competent in their application, maintenance and ultimate disposal including the dispatch of the target species and safe removal of non-target species. Recognised Qualification – BPC/RSPH (Level 2) Certificate in Pest Control, BPC Diploma Part I, BPC Diploma Part II, RSH Certificate in Pest Control and NVQ II Pest Control. Recognised Training Attendance- Confirmation of attendance at industry recognised training courses (e.g. BPCA, RSPH, Killgerm Chemicals, CSL, Acheta, ADAS). In House Training – Full details of any in-house training schemes. Product Specific Training – A recognised attendance certificate at courses for specialist products such as gas releasing compounds for vermin control. Any BPCA member who may be requested to supply to a pesticide end user with which they are not already familiar should use their best endeavours to ensure that users of professional products can show evidence of one or more of the foregoing. Fixed Stores – Fixed stores, including purpose-built stores, converted existing buildings or parts of existing buildings and small scale storage in cabinets, chests etc. Mobile Stores – Mobile stores providing short-term storage away from the home base in vehicles. BPCA Codes of Practice. Additional Precautions – Storing small amounts of particular pesticides whose hazardous chemical properties require additional precautions to be taken. Extensive UK coverage from our numerous local regional branches gives Pest Solutions the power to respond quickly to assist you to take care of your Pesky Pests today. BPCA Codes of Practice. Give us a call today to get a highly skilled member of our fully trained service staff come and aid you in dealing with that Pest Elimination problem. Get in touch with Pest Solutions on 0800 027 2555 today to get a FREE survey or to have a member of our service team solve your pest problem. Find your local Pest Solutions branch.